The talented Alex Jennings creates an atmosphere of gripping psychological tension and brings a variety of characters to life in this new audio edition of a crime classic. When the student Raskolnikov puts his philosophical theory to the ultimate test of murder, a tragic tale of suffering and redemption unfolds in the dismal setting of the slums of czarist, prerevolutionary St. Petersburg. While Jennings's adept repertoire of British accents works to demonstrate the varying classes of characters, it occasionally distracts the listener from the Russian setting. 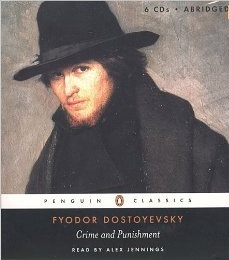 However, Dostoyevsky's rendering of 18th-century Russia emerges unscathed, bringing the dark pathos (such as wretched poverty and rampant suffering) to life.